While not all of us have the time, energy and determination to put in to being extreme couponers or hunting down the best possible bargains, I don't think that there's anyone out there that doesn't like to save money whenever possible. Or, even better, receiving something free once in a while! Which is why I'm happy to find the great promotion going on this week with Procter & Gamble and Kmart. This great duo have partnered together to help stretch our budgets a bit further with a deal that is not to be missed. It's just that easy! From June 24th to June 30th, Tide 75 oz. liquid detergent will be on sale for $8.97 at Kmart. With the purchase of their Tide, shoppers can receive a FREE 40 ct Bounce Fabric Softener Sheets (up to a $2.99 value. Limit one per transaction, while supplies last). Free is free, right? 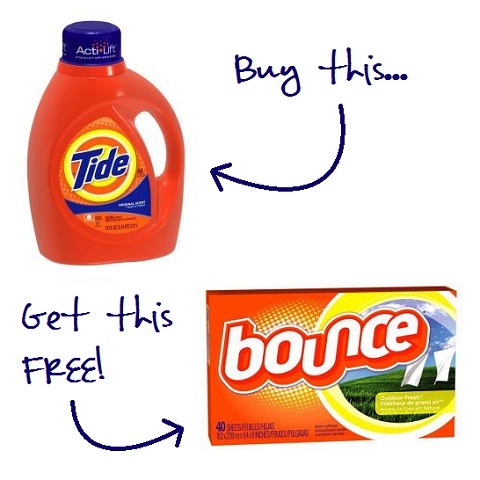 We all need to do laundry, so not only is it great to pick up a bottle of Tide when it is on sale, but free Bounce Fabric Softener Sheets is a fun bonus to go along with it! Be sure to head to your nearest Kmart by June 30th to take advantage of this special offer. 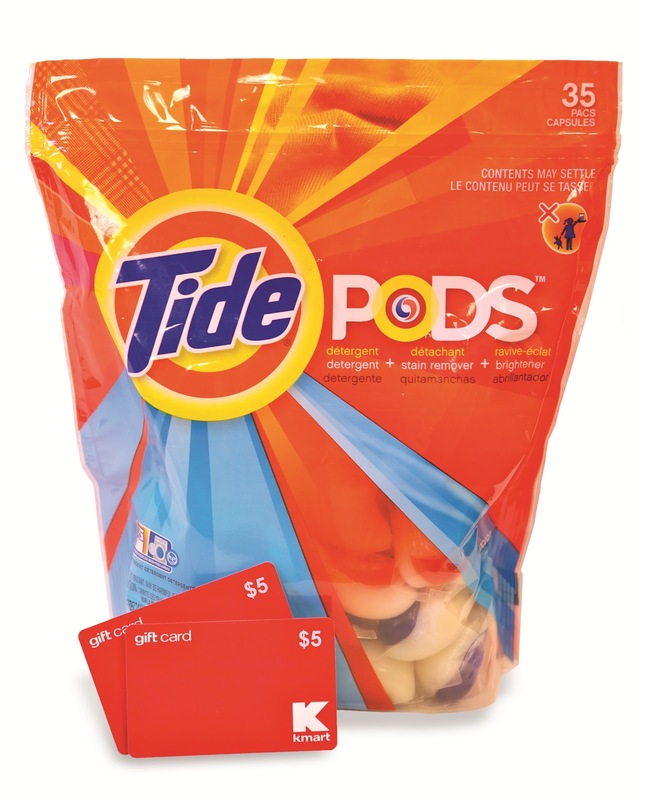 One lucky person will win a P&G/Kmart prize pack including $10 worth of Kmart gift cards and a 35 ct container of Tide Pods! A big thank you to Procter & Gamble for providing a P&G/Kmart prize pack for me as well as for one lucky giveaway winner. The opinions shared are my own and honest and if you really need to see more, click here to see how I roll. We use coupons and have a budget that we stick to. We try to conserve energy! I use coupons when I grocery shop to cut costs. I watch sales and buy staples - butter, flour, sugar, meat - when they're on a good sale, then seal & freeze/store in rubbermaids. We coupon, use cloth diapers and grow our own veggies! I use coupons to save money. We use coupons whenever possible and shop sales. I shop without my husband, the impulse shopper. I save money by line drying my laundry. My family has given up soda to save money. I buy during sales and use plenty of coupons. I also think twice before buying and ask - Do I really want/need this? i use coupons, check ad's. and only shop 1 time a month. and wont buy any thing i dont need. I try to stock up when things are on sale. Use coupons and plan meals ahead of time. Coupons, free samples, and stocking up when favorite things are on sale! I combine coupons and sales. I just always make sure to check out the sales papers before I go shopping. I check local grocery store sale papers for the best buy and use coupons. To save money I use coupons. I make all of our bread. saves us like a $1 each loaf and It is better for us too. We use alot of coupons to save money. I bring my lunch to work every day. Healthier and much cheaper! Case Sales on post! save money and can use coupons!! LOVE IT! line dry my clothes in the spring/summer. I go to Happy Hour! We buy food on sales with coupons. I make a lot of educational toys and games by recycling (a lot of us do ;)) for my daughter. And whatever toys we buy, we purchase them only at thrift shops or garage sales. We use coupons and watch for sales, and I love garage sales! Leave a comment on this post telling me one thing you do to save money. I use coupons and shop BOGOs at the grocery store. I comparison shop when shopping online. besides winning blog contests ;) - buy christmas presents throughout the year w/ good deals, i already have 3! I shop with coupons, use grocery game to comparison shop and looks for deals on blogs! I use coupons and check for sales. We are also very good at turning out lights and only turning the air on during really hot days.. I usually try to look out for sales that I can use coupons on. I need to buy a printer so I can print out coupons - I try not to buy it if it isn't on sale (or I buy the store brand). Also, praying that Aug. 22, 2012 goes good for me - that means we buy Geothermal and Solar Panels for the house - praying! I use coupons, enter sweeps, and try not to eat out. I use coupons and watch for sales. I try cook at home instead of eating out. I make food from scratch and it saves a lot. I plan our menu with what is on sale for the week! Whatever is needed or wanted. We turned our cable off. I use coupons and I also use the store credit card to get further discounts. I use coupons on sale items. Use coupons and shop online whenever possible to save on gas. Recycle bottles & aluminum cans - cash back is well worth the effort. I hang the laundry instead of using th edryer to save money on electricity. I love the the already portion size, and of course the smell! I do the new R of recycle, reuse, ...I Repair. If it can be fixed, i do and continue using it unstead of buy new. To save $ we grow most of our veggies. I use coupons way more than I use to! I combine sales with coupons.Thanks for the chance. We shop with coupons on double-your-coupons day. Thanks! I've stopped buying name brand products unless I have a really good coupon for it. Thanks. I'm a very careful shopper and take advantage of sales and coupons. I also try to use what I already have instead of buying new. I use coupons at stores and restaurants. I use coupons and stock up when my family's favorites are on sale. I spend time every week trying to make sure I am getting the most for my money for groceries. I love using ebay to save! Use coupons and stick to our shopping list. I try to wash as many clothes together as possible to save on water. I watch sales and compare shop online. I use coupons and shop sales and clearance. Take turns grilling dinner with a friend. I use coupons when shopping for groceries/household items. I have a coupon binder and I use coupons for everything. I do my best to never need to buy something without a coupon/good sale. I combine my shopping trips to save gasoline. we try to use coupons. Thanks for hosting! We use coupons in conjunction with the current sales! I use coupons but only when the item is on sale anyway, AND only use my coupons at stores that do double coupons! I combine coupon and sales, and also look for good deals on the internet. Thanks for the chance to win! I use coupons and I don't make as many trips to the grocery. This saves $$$$s of impulse buying! i use save with coupons! We use coupons and only buy what is necessary. I use coupons and cut out luxuries. We use washcloths instead of toilet paper. Just kidding. I cook at home and never eat out and i take my lunch to work. we unplug all appliances that are not being used. I like to go thrifting and garage saling for things I need! Especially when it comes to my jewelry businesses. I combine coupons and loss leaders in store ads whenever possible. we buy things only when they are on sale. We got rid of our cable bill by ordering netflix. We save over a hundred dollars a month! I find coupons to print online, I look for deals on store circulars, and I don't buy too many frivolous things. I buy what I need instead of what I want, shop for the best prices and use coupons. i have a strict budget and i keep track of my spending. and coupons! Manager's specials and clearance racks. I buy everything on sale if I can. I enter sweepstakes so that I can win things and not have to by them.